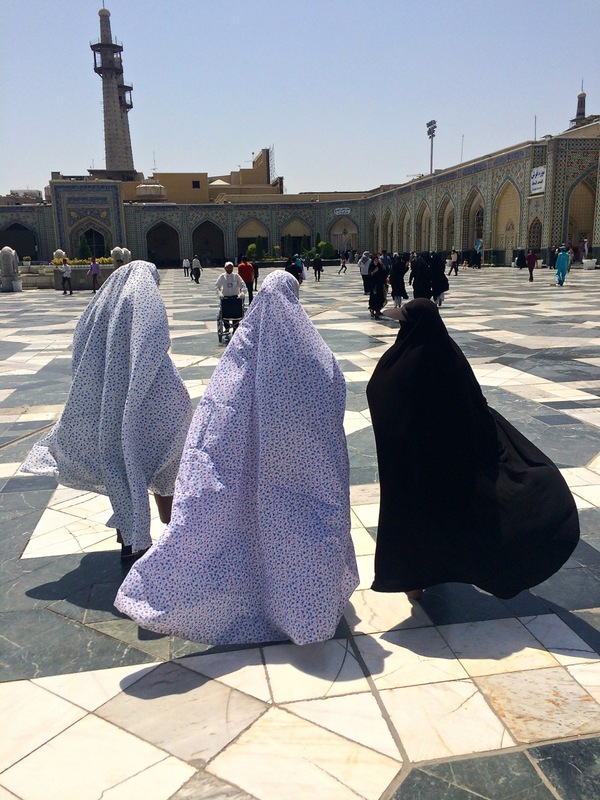 Another border crossing last Tuesday: Turkmenistan – Iran. Now that’s a border you don’t cross every day. Although the Turkmen soldiers at the border took their sweet time having lunch and taking it easy, while we were waiting together with dozens of others… leaving Turkmenistan went fairly quickly. No extensive car-check, no filling out of 60 forms, no more payments. So we were ready for Iran. The Iranian border is directly attached to the Turkmen border (normally there is a small or larger driving distance between two posts, but not here). So, within 100 meters I had to put on my long sleeves and headscarf and I managed :-). We were welcomed by three Iranian soldiers who started talking about Van Persie and Robben with Bert right away, gave him travel tips for nice places to visit in Iran and were probably entertained by the fact that I was driving the Blue Beast. It is like entering a whole different world! It is actually a little like entering the first ‘normal’ (almost European-like) country again since weeks; procedures were quick, efficient and everyone spoke perfect English. Before we could get lost we were caught by another soldier who told us exactly what the next step for customs or immigration was, documents for the car were perfectly handled… We were stunned! 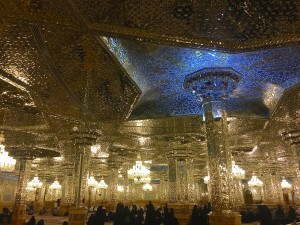 The roads were good driving into Iran and stayed good until our destination for the first day – Mashhad. 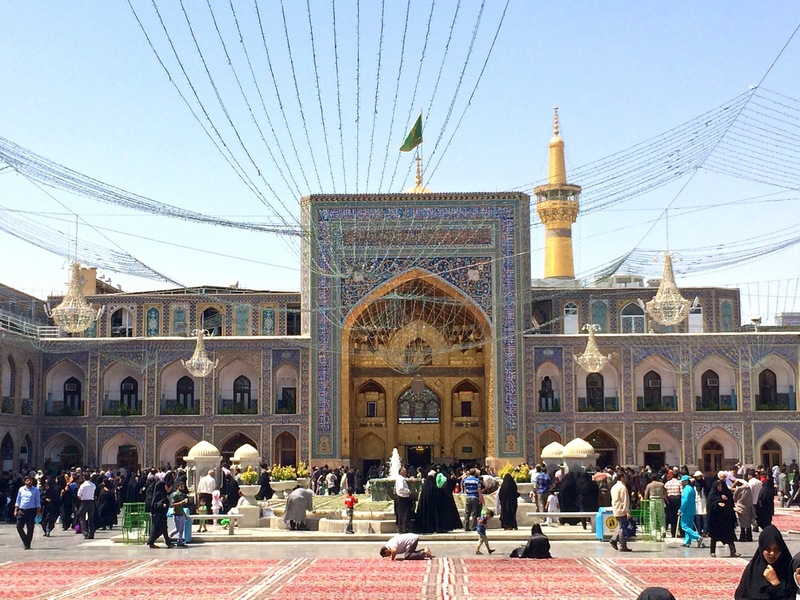 The holiest city of Iran because of the Shrine of Imam Reza. 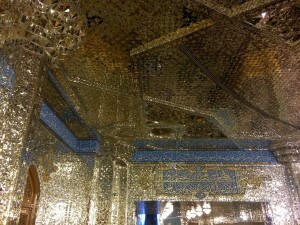 A very well-known Imam who lived 700-800 A.D. and is loved by all Shiite Muslims. 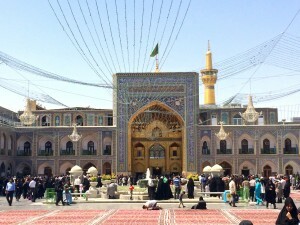 Mashhad is the third or fourth most holy place for Shiite Muslims in the world and many (20 million a year) come here for pelgrimage. 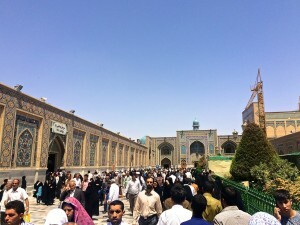 During the summer months especially Muslims from surrounding countries (Arabs, Pakistani, Afghani) come to Mashhad (sometimes for two or three months) – and yesterday, while visiting the holy shrine, our guide Fatima told me how to distinguish Arabs from Iranians, Iranians from Pakistani, Pakistani from Afghani, etc. The shrine was magical. 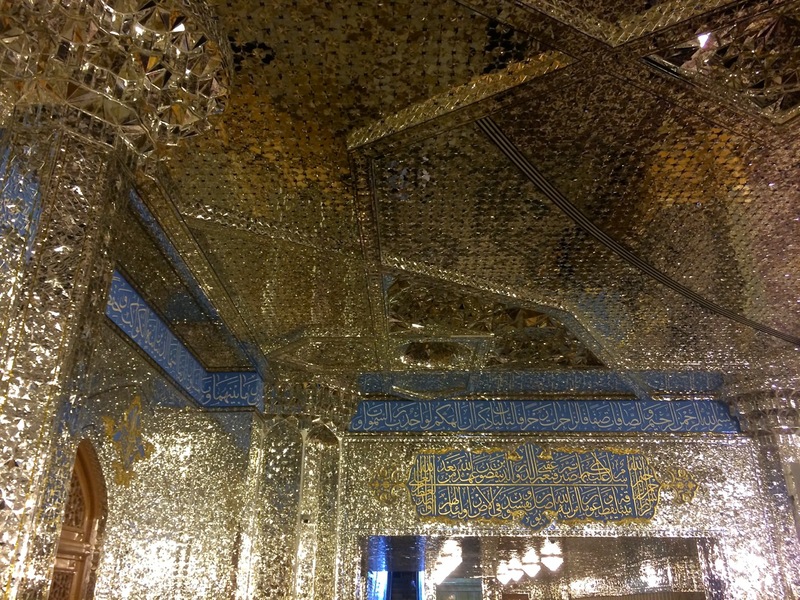 We were blown away by several courtyards with minarets and beautiful buildings surrounding them and some spectacular mirror halls (see picture). 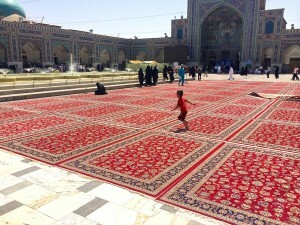 The courtyards most of the time completely covered with Persian carpets and people praying. Some of the courtyards and buildings (especially close to the tomb of Imam Reza) we were not allowed in because we are not Muslim, but we could take a peak around the corner. 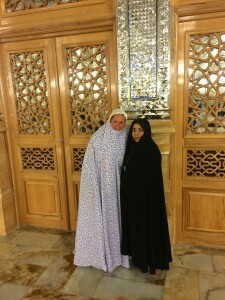 We were joined by Fatima, which eventually was great as she could tell us a lot (we actually HAD to go with a guide since I tried entering the Shrine without a Chador – the ‘tent’ that covers your body from head to toe – and Fatima brought me one). It was so so busy inside the Shrine – what a contrast with the cities we saw in Uzbekistan, that now feel like open air museums compared to Mashhad. We’re so happy to have first visited Uzbekistan and then Iran, since if it was the other way, we certainly would have been disappointed. 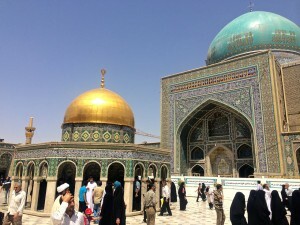 Now it’s Thursday and we will leave Mashhad today to drive more south towards Yazd. 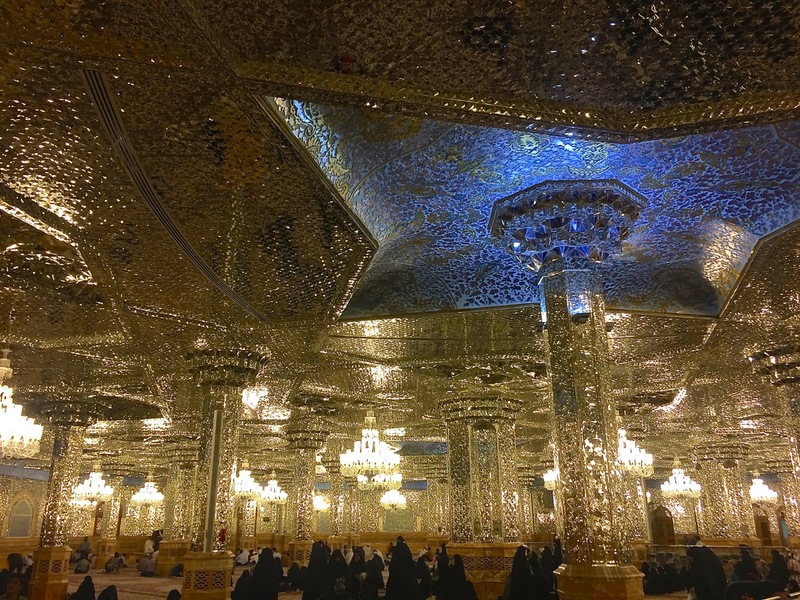 These first two days in Iran have been a blast. The food is delicious, the people are amazingly friendly, the city is chaotic and alive and we are full of energy. For me it is sometimes a little annoying being completely wrapped in scarfs and long clothing… and for Bert the afternoons are a lot less fun without his well-deserved beer, but we are very happy to deal with it in order to see more of Iran. Leuke jurk Mir, staat je goed. Vooral die bloemetjes stof! Van Wouter kregen we jullie website door en we hebben met veel plezier jullie fantastische reiservaringen gelezen. Wat een ervaringen doen jullie op. Om zo terug naar huis te keren is geweldig. Wij wensen jullie een goede voortzetting van dit avontuur en we hopen dat we jullie een keer in Nederland kunnen begroeten . Misschien als Wouter ook thuis is. jullie zijn altijd welkom.